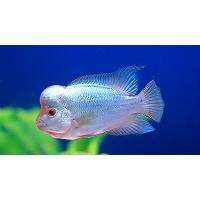 we are offering flower horn, red dragon flowerhorn fish size is 4inch and it will be imported one. Flowerhorns cichlids are ornamental aquarium fish noted for their vivid colors and the distinctively shaped heads for which they are named. Their head protuberance, or kok. Like blood parrot cichlids, they are man-made hybrids that do not exist in the wild. Malas Aquarium Fish Farms Breeder &..